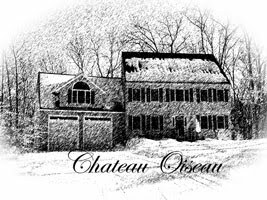 Chateau Oiseau: The 2010 Malbec is pressed! Well, this evening the Malbec was down to 2.5 Brix so it was time to press, after a 10 day fermentation at 80 degrees. My daughter helped me out and, as usual, we had to press by hand. 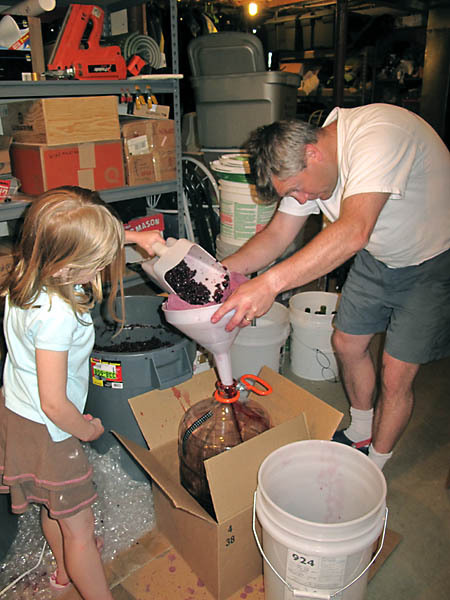 We start by disinfecting our hands with oxyclean and disinfecting the carboys, jugs, etc. We can't use sulfite to disinfect at this point as it would be toxic to the malolactic bacteria to be introduced later. So we use oxyclean, which works well using oxygen to kill microbes. Next, we go scoop at a time, dumping must into a mesh bag in a large funnel over a 6 gallon carboy. After a little over an hour pressing, we had 9 gallons (!) of wine from (7) 18 pound crates of Malbec grapes. 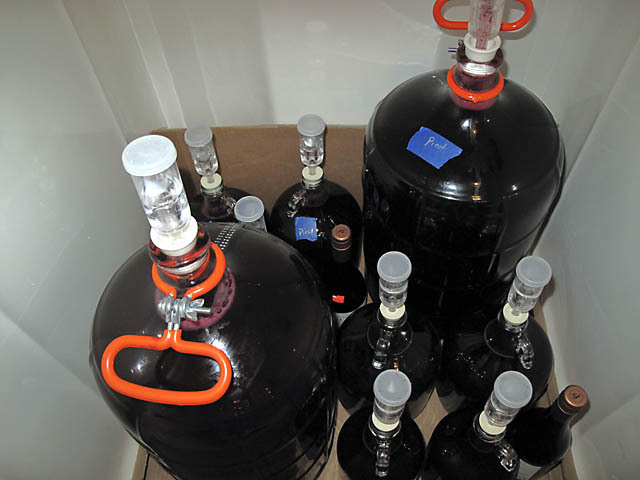 We put airlocks in all the jugs and put them in the first floor bathroom shower to finish fermenting. Why the shower? Well, we never use our tiny first floor shower, and it's about 75 degrees all the time in there (we have central AC so we keep the house pretty much at 75 in the summer). 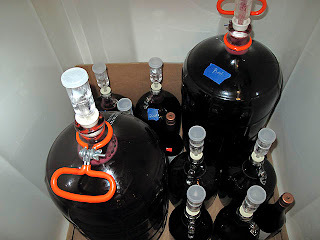 The cellar is too cold to finish fermentation without heat, and the electric blanket is not consistent enough when wrapped around 2 carboys, 4 one gallon jugs, 3 half-gallon jugs, etc. So the Malbec has joined the Pinot Noir that was pressed two days ago in the shower, and it will sit for a few weeks to completely finish fermentation. They are all nicely bubbling though their airlocks now.